A beautiful Sitterle home with a spacious open layout. 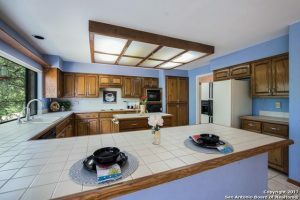 Kitchen has ample cabinet space,island, and breakfast bar. Kitchen opens to the living room which features an elegant brick fireplace and wet bar perfect for entertaining. Backyard is perfect for family and friends with custom multi level deck and jacuzzi. Tile Roof! Mature trees surround the home for great shade. Established community with mature trees in a fantastic location! A must see! 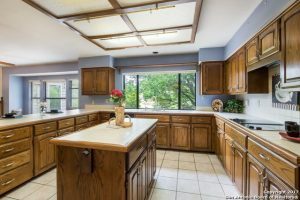 If entertaining is your forte, there is no better place to do this then from the kitchen in this amazing Spring Branch TX home. 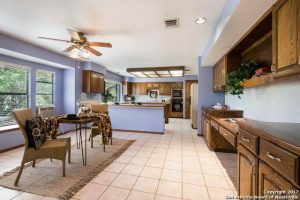 With stainless steel appliances, a large breakfast bar, and ample counter space you will love cooking here! The vast amount of space and open floor plan makes bringing friends together so easy. 1011 Blvd ,is one of the most desirable areas in the entire San Antonio TX region. With excellent schools and a close proximity to the city. it’s an oasis just inside of the city. Thank you for reading about 1011 Sutters Rim San AntonioTX 78258.